Hundreds of patrons line up everyday in front of the The Lady and Sons restaurant in Savannah for just a glimpse of the owner. Paula Deen’s best selling cookbooks, her hit show Paula’s Home Cooking on the Food Network, and most importantly her personal story have become a positive force for millions of people.Living with agoraphobia for twenty years and a crumbling marriage, Paula was left with two growing sons and no source of income. As a girl reared in the deep South, Southern cooking was in her heritage and the kitchen became her only hope. With only two hundred dollars and her sons, Paula launched a home-based lunch delivery service called The Bag Lady in June 1989. The business model was simple: She made the sandwiches and her sons went out and sold them. Two years later, with The Bag Lady growing too large for a home-based operation, Paula opened her first restaurant on Savannah’s Southside called The Lady and within five years, it also became too successful for such a small space with limited seating. On January 1996, Paula and her sons went from selling tuna fish sandwiches in saran wrap to running their own downtown restaurant in Savannah’s City Market. The Lady and Sons opened her doors to faithful customers, celebrity clientele, and thousands of Savannah visitors seeking out Paula’s famous fried chicken. Paula self-published her first cookbook in 1997, The Lady and Sons Savannah Country Cookbook. A major publishing house quickly picked it up after a literary agent unexpectedly came into the restaurant for lunch to escape a thunderstorm. She bought the book and immediately saw its potential. Paula began her road to national recognition in 1998 by promoting its sale on QVC television where it became one of the best selling cookbooks. In 1999, she published her second best seller The Lady and Sons, Too! and her third The Lady and Sons Just Desserts in 2002. Paula’s Home Cooking aired on the Food Network on November 16, 2002 to rave reviews and was immediately embraced by the public. In 1999, USA Today awarded The Lady and Sons restaurant the “International Meal of the Year,” and a guest appearance on the Oprah Winfrey Show triggered hundreds of letters from women who took charge of their lives after watching Paula tell her story. .
Paula brought a southern touch to Food Network with her show, Paula’s Home Cooking. She also surprised the owner of a century-old home with a kitchen makeover in a style all her own on the 2005 Food Network special, All-Star Kitchen Makeover. Paula’s deft hand in the kitchen, combined with her flair for dramatic touches, have set her restaurants and cookbooks apart from the others . Her determination, hard work, and innate warm Southern charm have done the rest. Do you want to hire Paula Deen? Directly request a quote. In 48 hours we can send you the availability of Paula Deen If you would like to book Paula Deen, Entertainment Booking Agency is the right place. 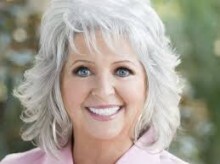 We will offer you the best price and contact the management or we directly contact Paula Deen. For corporate appearances or speaking engagements you can contact our agents and the will help you true the process. Tags: hire Paula Deen, Paula Deen booking, book Paula Deen, Paula Deen appearances, find more information on booking Paula Deen for appearances, Paula Deen speaking engagements, Paula Deen endorsements/spokesperson, Paula Deen appearance fees, Paula Deen booking agency contact info, biography of Paula Deen, Contact an artist booking talent agent find a speakers bureau that can book Paula Deen, speaker booking agency for Paula Deen, Paula Deen booking agency, Paula Deen booking for corporate event. EBA is one of the biggest entertainment booking agencies in the World. We book hundreds of celebrities, artist, athletes and speakers in a year. Important to know is that we are not claiming to be the management of Paula Deen. We are not the official agent for Paula Deen. Companies from around the globe book these artists and speakers true our company be course we have one of the biggest networks and we always have direct contact with the artist or the management. We help you to find the right celebrities for your corporate of private events. Please contact one of our agents to get free advice and we will help to get the world-famous artist on your party.